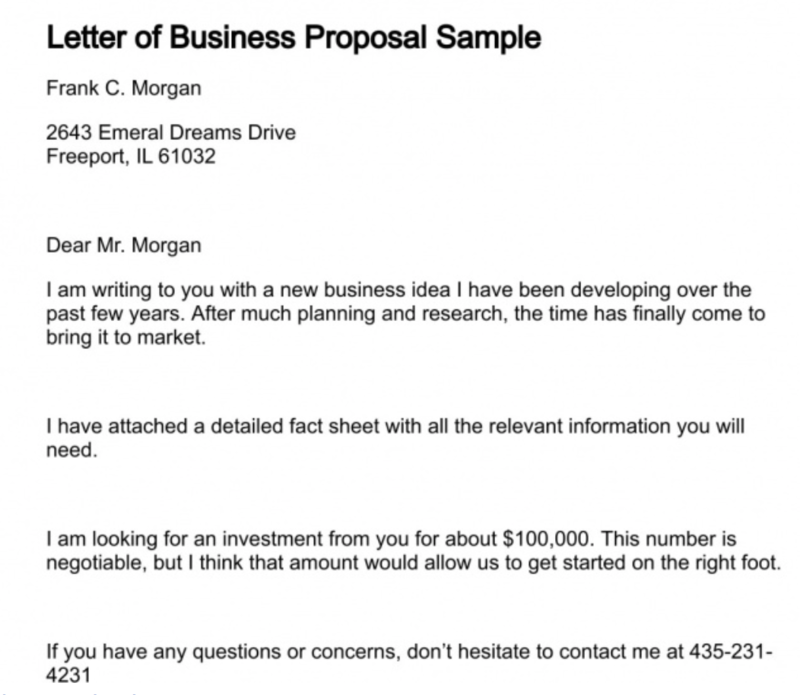 Business proposals are documents designed to get someone else to buy another company’s products and/or services and are the lifeblood of many businesses. They’re one of the most critical parts of the sales process. Despite their importance, however, many businesses struggle with creating successful business proposals for the sheer fact that they don’t know how to effectively write them. In the following guide, you’ll learn how to write a winning business proposal that’s guaranteed to convert. 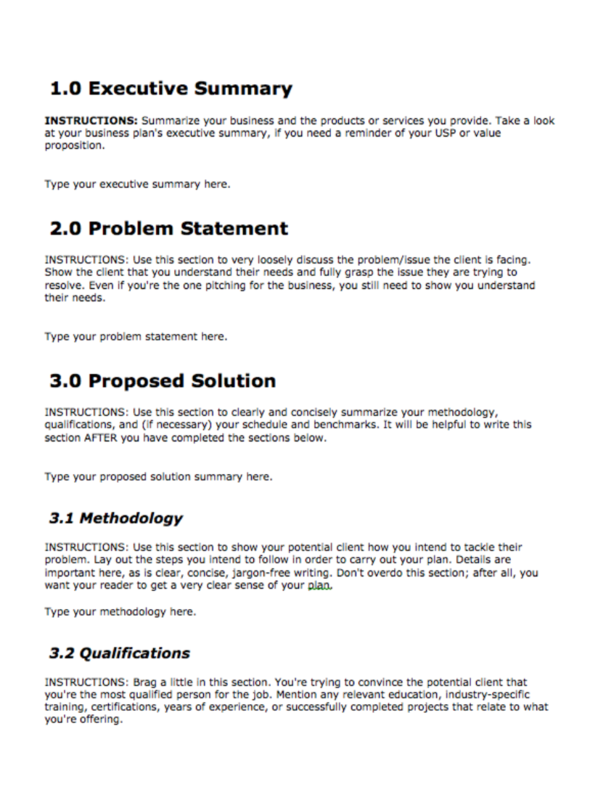 Your business proposal should be streamlined, succinct and well organized. 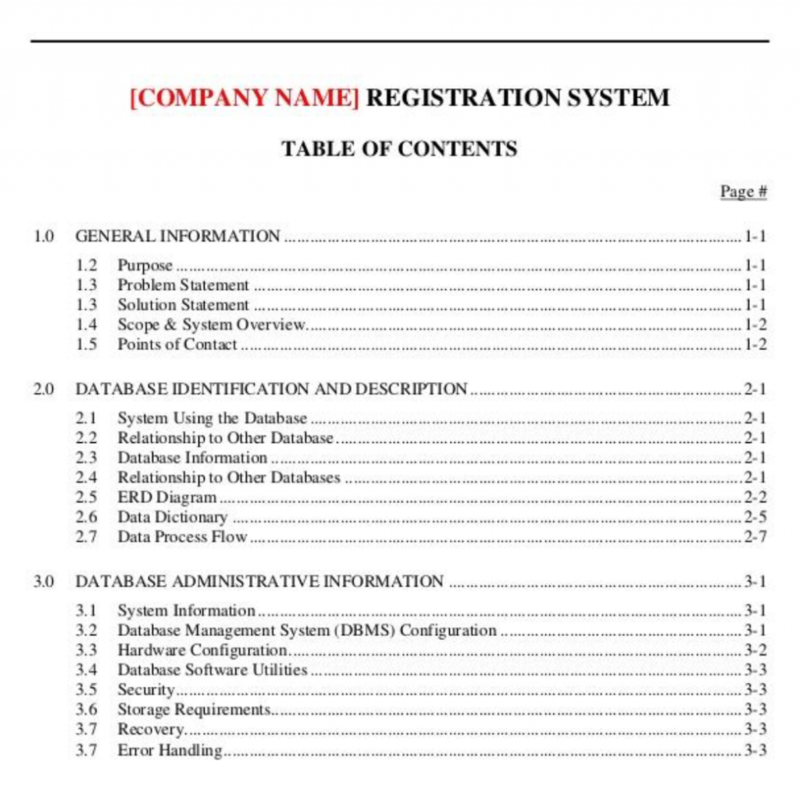 For this reason, many companies do not include a table of contents. 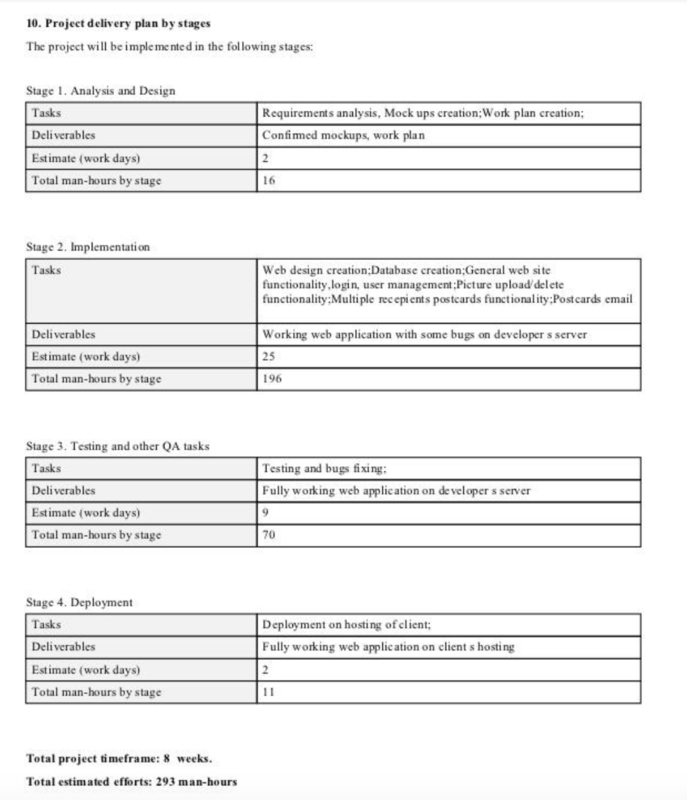 Projects that require a lengthier business proposal should always include a table of contents for navigational purposes, however. This saves people time by pointing them to the exact section and information they need. 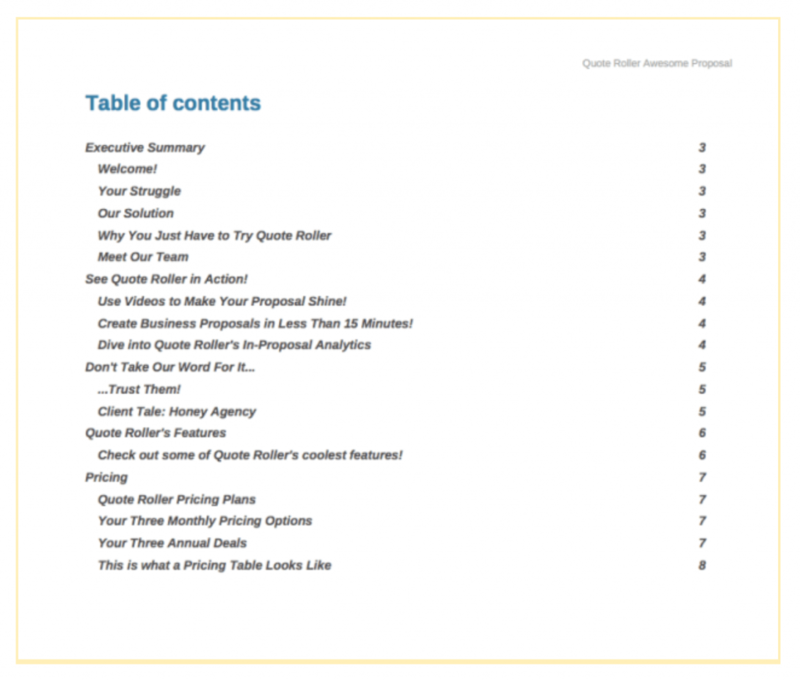 You can use an outline to format your table of contents. 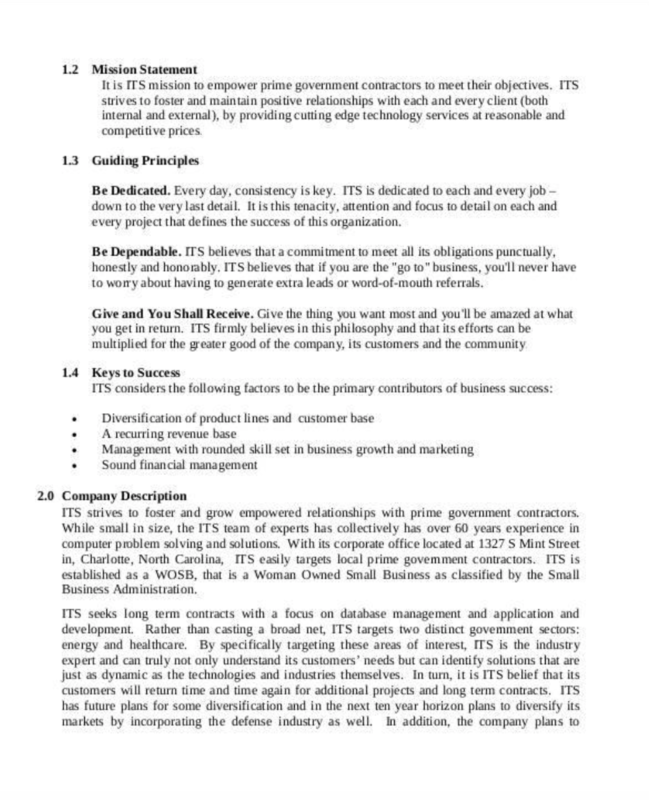 List each section inside your proposal, and then place the topics covered for each below its respective heading. 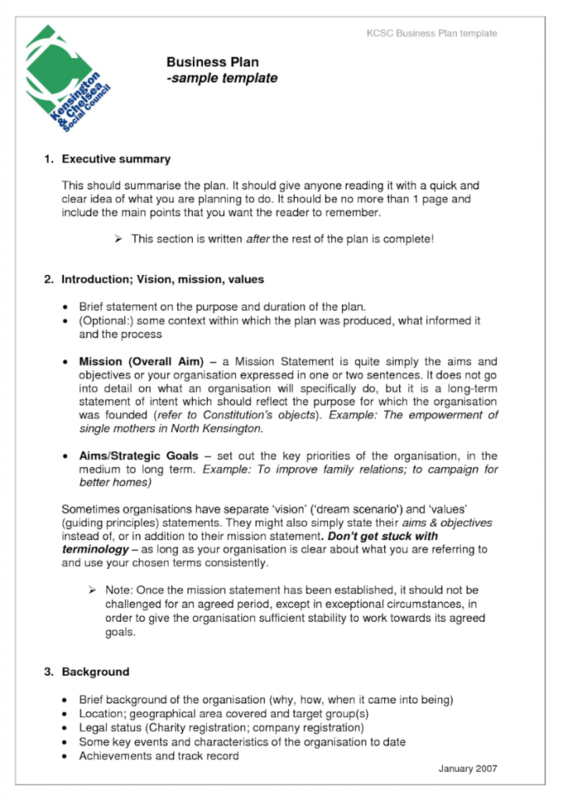 Your executive summary is one of the most important parts of your proposal. It should explain why your company is the right choice for the proposed project, so approach it empirically and use powerfully persuasive phrases. These phrases are explanations of who you are, what you do, what you want. Don’t just tell, explain your overall goals. Since your executive summary is one of the first things someone is going to read, it needs to sell your solution to the client’s problem in a succinct, yet compelling manner that focuses specifically on one thing: results. This is a well thought out summary that is not only executed well but structured perfectly since it identifies the problem and identifies the solution. With this summary, it provides not only a way to read more about the proposal, but it shows that the writer took the time to lay everything out in a quick-to-read pace. How do you perceive the potential client’s brand? What are the pain points and issues? What do you plan to do to resolve these? What are the steps you’ll take to implement your solutions? What should be noted as not included in your proposed resolutions? How will successful outcomes be calculated? What is the timeline from implementation to fruition? How will potential risks be mitigated? 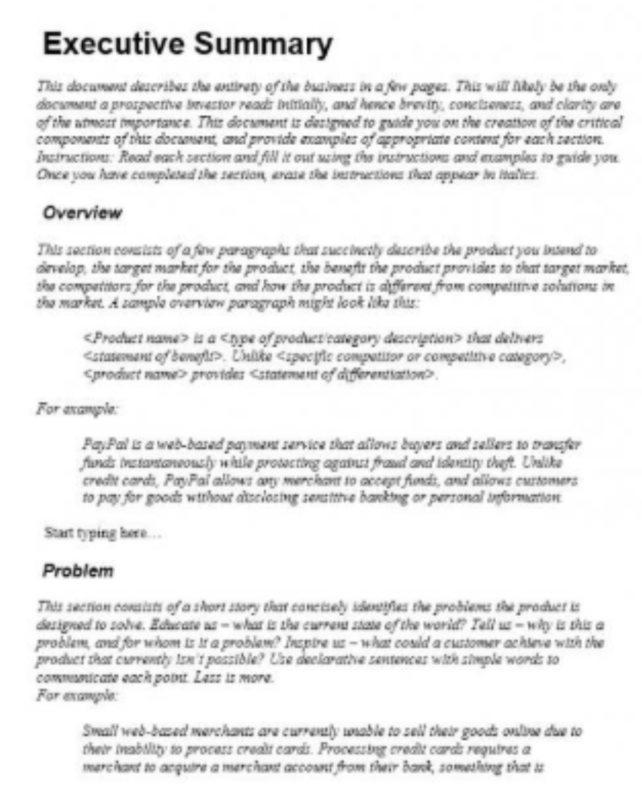 This scope of work is outlined in the proposal in a nice, short and sweet paragraph that states exactly what the writer is looking to obtain or their specific goal. It shows what the outlook is for the next year and so on. TIP: when you’re answering these questions, focus solely on the client and their business. Don’t make this section about you. You’ll sell why you’re the best solution in the proposal body. The body of your proposal is the true “meat” of it. Your goal with the proposal body is to provide as much information as you can regarding your company and your solution. Who will oversee implementing your solution? Who will that person or group turn to in the event of a problem? What are the company’s main concerns? What must be done in detail? What are the associated risks and how will these be mitigated? Where will the work take place? Onsite? Remotely? A combination of the two? When will work commence, and for how long? Why is this what you’re proposing the best approach? How will communication be handled? Via phone calls? Email? Skype? Video conference calls? Detailing the answer to each of these questions will provide critical data the end reader needs to make a decision about what you have to offer best meets their needs. This information also offers insight as to whether you have the knowledge, power, and resources to effectively implement what you’re proposing. As you write the proposal body, be sure to consider the what-ifs. 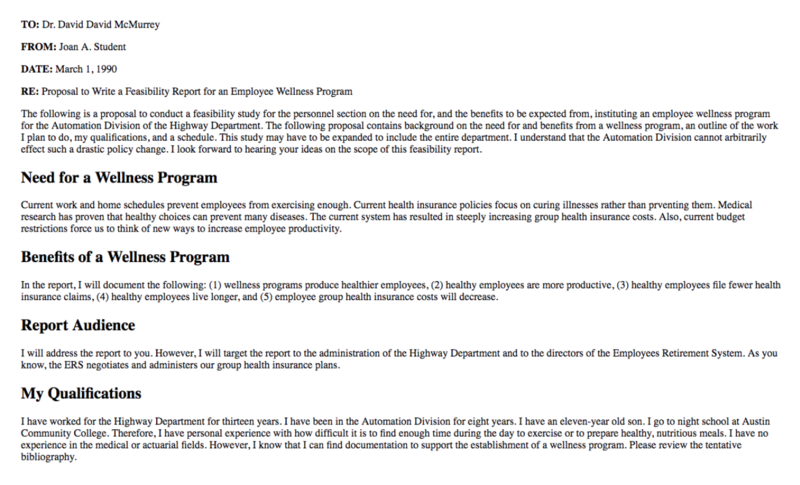 It’s a good idea to include a caveat section that addresses these contingencies if details suddenly change. You cannot predict everything that will happen, so you need to be prepared for the possibility of shifting circumstance. Again, this is a nice body that provides the reader with the who, what, where, when and how questions answered. This proposal body neatly lays everything out and is not too wordy, which allows the reader to skim through the information and obtain the answers they seek before moving forward. This section explains your qualifications. What is your company’s experience in providing the proposed solution? What’s your success rate been? Do you have unique training and/or certifications that your competitors do not? Brag a little. This is your time to shine. 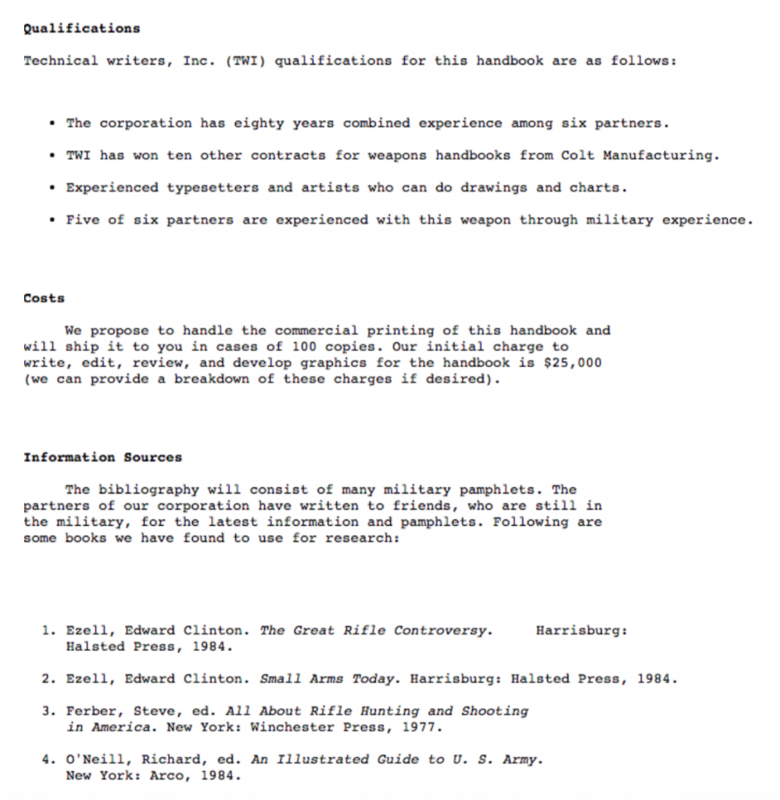 Also be sure to introduce any collaborators who will be involved, as well as their respective qualifications. Be sure to include a timeline as a roadmap to lead your potential client down the path of your solution. 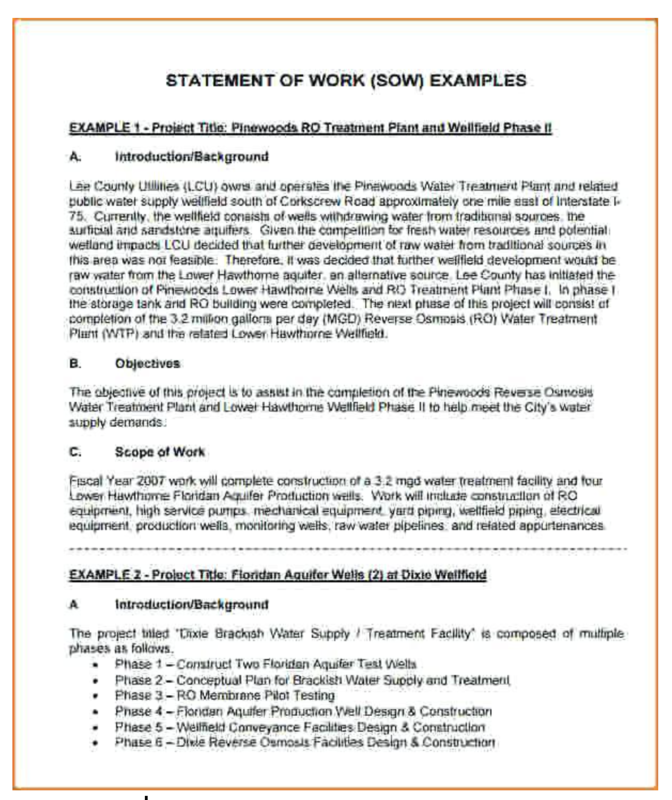 Benchmarks indicate the successful completion of each phase along the resolution timeline. Transparency is essential so be sure to include realistic benchmarks. Clear communication is an important key to building lasting professional relationships. 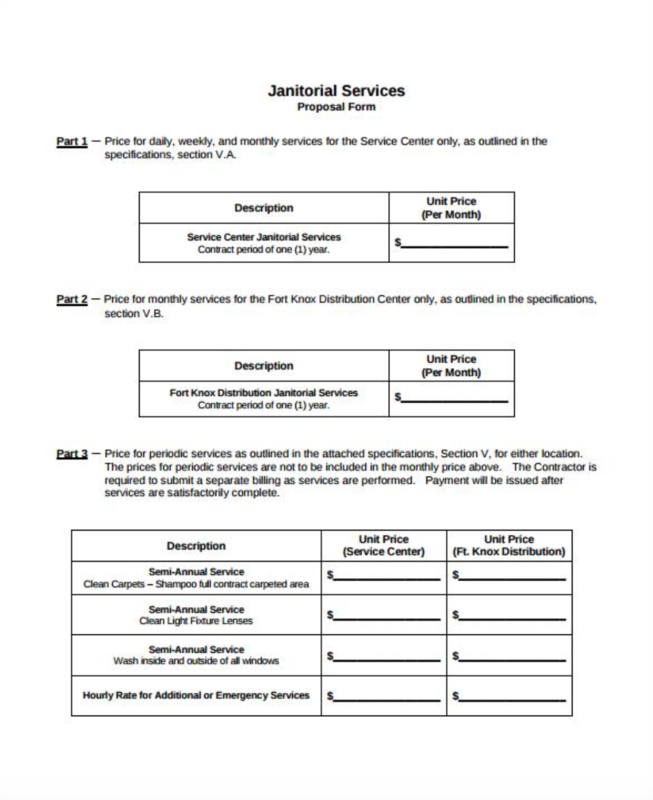 In this section, you’ll explain your fees, as well as associated due dates. Keep in mind that in this section, persuasive language can be a powerful conversion tool. Your potential client will be more agreeable to investing in your proposal than paying a fee. Use your designated benchmarks to determine for specific due dates for payments, so that everything fits together nicely. 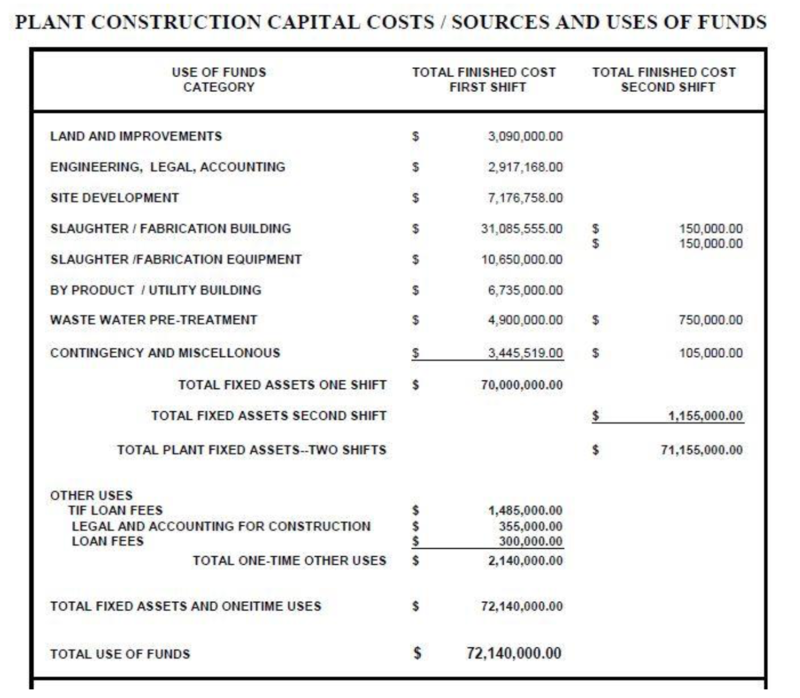 Also be sure to calculate all the labor and costs involved with implementing your proposed solution. Many experts recommend overestimating at least a little to cover any unforeseen expenses. They have a reputation for cropping up, especially if they were never configured into the projection. It is always better to have unused resources than unexpected expenses you’ll most likely have to eat out-of-pocket. Carefully review your business proposal to ensure all the requirements have been fulfilled. Ensure that there are no typos, misspellings, or grammatical errors. It should be clean, clear, and flow smoothly. 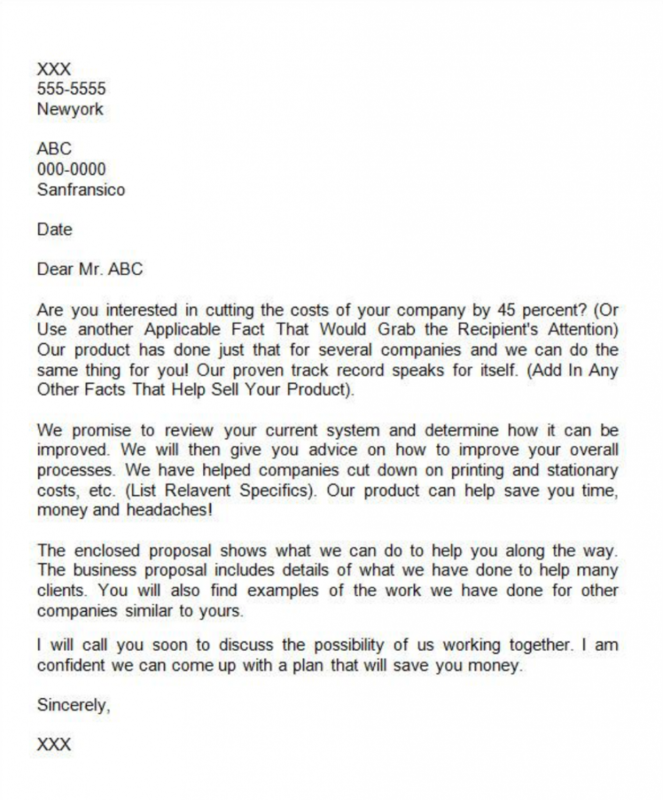 Many times, business proposals are rejected simply because they are sloppy, even if the resolution presented is sound. Always read and re-read what you write. Read it out loud. There should never by typos! Congratulations, you now have a business proposal that you know is going to knock the socks off of your prospect. Now, you just need to send it. More often times than not, you’ll be sending your business proposals via email. And this email is what often separates the winners from losers. Don’t skimp on investing the time to create a compelling email, simply because you’ve already spent so much time on the proposal itself. It’s an extremely common mistake and one that should not be overlooked. Unfortunately, there’s no one-size-fits-all approach to writing business proposals, and what’s contained in each will vary greatly depending on the industry. Depending on the niche you work in, following the exact business proposal format outlined above might not make the most sense. For example, business proposals for marketing and advertising should be packed with powerful visuals. For proposals for bank loans, you’ll need to include extra information such as why you need the loan, how much you need, your plan to repay the loan, as well as a backup plan for repayment. This is all information that the bank is going to need to determine whether they can approve your request. While bank proposals are different than standard business proposals, where a business is trying to get another business to buy their products and/or services, the premise is still the same. You’re trying to sell someone on why they should approve your request for funding. For restaurants proposals, you need to focus on why you would like to open a restaurant, as well as how you will maintain it. You need to be able to show what you’re going to serve and why customers would want to come and eat there. Showing the reasons behind why you’d be profitable and how you’d make this happen are key to proposal acceptance. Restaurant proposals are similar in concept to bank loan proposals: you’re selling someone on why they should work with you. For nonprofits interested in applying for government grants, these proposals need to explain the reasons behind applying for this type of money. No one is going to give away money without seeing the return, as well as the reason for giving it. A big part of this type of proposal is the why, so focus heavily on why you need the funding, as well as what you are going to do with it to put good out into the world. At the end of the day, every industry requires a different type of format, and when you’re writing your business proposal, it’s important to take into consideration the purpose of the proposal in the first place. Obtaining funding will rely heavily on financials, while a new product or business launch will rely heavily on the problem your solution solves. Also, always make sure you remember who you are addressing and what’s in it for them. Determine their goals and objectives. Use words, images, and evidence to drive decision makers down a path that leads to your proposal being accepted. If you’re reaching the point of feeling overwhelmed and fear that you may not be able to write a winning business proposal on your own, you’re in luck. There are a variety of different resources available to you to help guide you along the way. Some are free, while others are paid. Law Depot – Law Depot has a treasure trove of templates to choose from, depending on your needs. 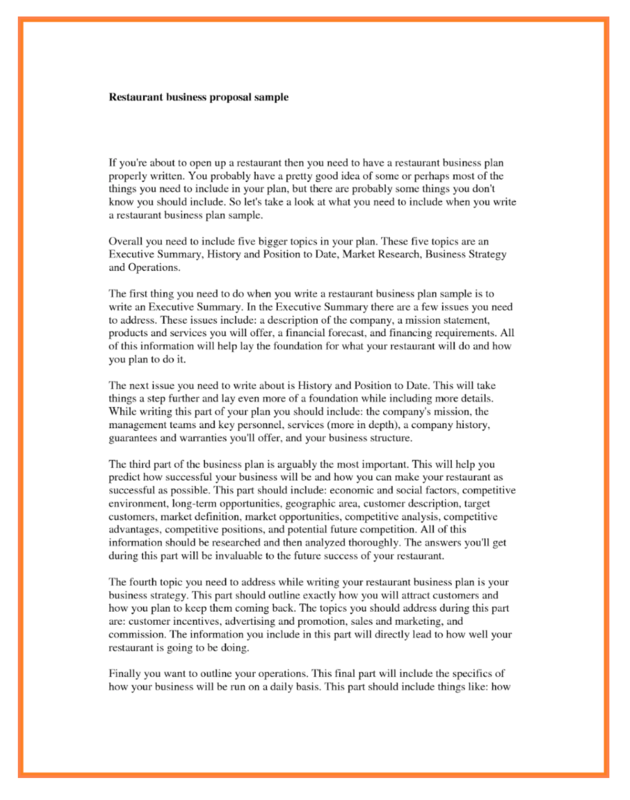 BPlans – BPlans is one home to both business proposals and business plans of all types. Proposable – Proposable has a wealth of proposals to choose from, regardless of your needs. Proposify – Proposify has nicely designed proposals for a variety of different purposes, including business and funding. Rocket Lawyer – Rocket Lawyer makes creating proposals a snap. 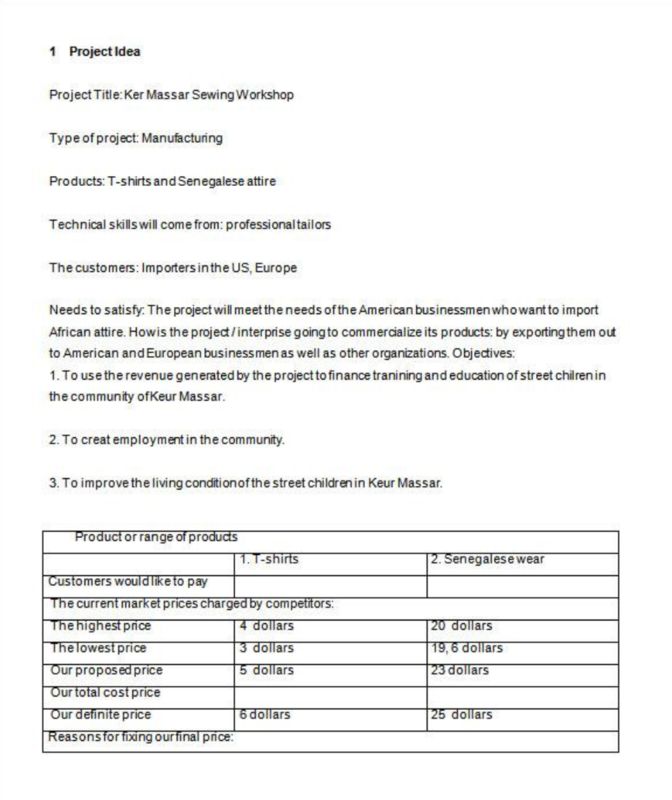 Simply find the template you’re looking for, fill in the information, and send it off. Capital West Advisors – Capital West Advisors provides top of the line, expert created business proposals for pretty much every niche. BizTree – BizTree promises business proposals done right through the use of a service that asks questions, gets answers and puts the proposals together for you. Optimal Thinking – If you’re looking for a proposal that looks sleek, upscale and professional, Optimal Thinking is for you. Business Proposal Writing Service – Business Proposal Writing Service is a little smaller, but provides a touch of care that you won’t find with bigger names. Their proposals are high quality, professional, and affordable. A business proposal provides the end reader with more information about what it is that you have to offer. Every business is different. Make your proposal stand out by following the guidelines outline above. Invest the time and resources so that your business truly stands out from the competition. While the work may be tedious, it’ll pay off in spades in the long run.